Kobolds & Catacombs is set to hit Hearthstone in about a month, so Shacknews stopped by BlizzCon to ask Principal Game Designer Mike Donais and Senior Concept Artist Jomaro Kindred about what players can expect to see. Hearthstone is off in search of treasure in the upcoming Kobolds & Catacombs expansion. It'll be the last expansion to close out the Year of the Mammoth and Blizzard has some big plans for it, including some new mechanics and the new single-player Dungeon Run content, which Shacknews had a chance to try out at BlizzCon. Prior to BlizzCon wrapping up, Shacknews had the opportunity to speak to Hearthstone Principal Game Designer Mike Donais and Senior Concept Artist Jomaro Kindred about what players can expect from Kobolds & Catacombs. They also go into detail on the new mechanics, as well as what players should prepare for with Dungeon Run. Shacknews: I'm always curious as to how the team decides on the themes for its expansions. So with that said, how did the team decide on Kobolds? Jomaro Kindred, Senior Concept Arist: Well, we always like to explore new and exciting ideas. We all get together and toss around ideas and the whole team will get into a big room and white-board ideas. Sometimes ideas will come up multiple times and sometimes we think "Maybe we should go in that direction." Sometimes we don't even do that! Sometimes, someone just comes up with a hot one and I think Kobolds & Catacombs is one of those hot ones. Mike Donais, Principal Game Designer: We all love treasure and adventure and we all grew up with movies, books, and role-playing games that are all about those kinds of ideas. To be able to capture that in a kind of Warcraft-y way and bring it into Hearthstone is super exciting to us. Shacknews: In terms of single-player content, you guys went in a bit of a different direction this time around. What made you want to deviate from the single-player adventure formula in favor of a roguelike? Donais: We really love the adventure format. It did a lot of great things for us. It made people play Heathstone and learn about Hearthstone in a totally different way. And I think this way also hits a lot of those goals and feels a bit cooler. We've been playing a lot of games like this at work recently and we were thinking "How does a game like this translate into Hearthstone?" And a few times in the past, we've tried to do that and this time, we've finally had the resources to really do a whole bunch of new cards, a whole bunch of new bosses, a whole bunch of new treasures, and do it all-out. Add a new treasure system, the leveling system, the important decisions, all that and put it all in one mode. We have people that are working on just the missions that we call Dungeon Run and they did a great job. Shacknews: Is there potential for more to come to Dungeon Run in the future? Donais: We release something every four months. Four months ago, they released the Ice Crown content and it was awesome and it was all-new. This time, it's Dungeon Run. And they'll be working on whatever the next awesome thing is for four months from now. Shacknews: I know Dungeon Run players will pick cards for their decks as they go along, but will that first handful of cards that they start with be constructed, randomized, or the same cards each time? Donais: There's nine different classes and within those classes, you'll get the same specific ten cards that are carefully curated. As you go, they'll start changing. Like every time you get three picks of three cards from 12 possible "buckets." A "bucket" might have 15 different Elemental-related cards in it and it'll show you three Elemental cards. Maybe three Dragon cards. Maybe three C'Thun cards. Pick the one you want and then you'll get to pick from three more "buckets." There's a lot of variants after the initial decks. Shacknews: Is that why you decided to make Dungeon Run a Wild experience, as opposed to a Standard one? Donais: Yeah, we didn't want to be constrained too much. We wanted to use all of the different cards from Hearthstone's history that are available and useful to make fun stuff. Shacknews: What was the main design goal when it comes to the new Legendary weapons? Donais: I think it's really cool to have and see what weapons look like on all these classes. We really wanted to hit up treasure really hard and magical legendary weapons is the ultimate treasure. So we brainstormed the treasure ideas and I think we did a good job of making weapons for Mage, Priest, and Warlock that capture their flavor and are very different than Rogue, Warrior, and Paladin, which hit people. Shacknews: With Legendary weapons becoming a central feature of this expansion, does that mean players should expect to see more cards with effects similar to Harrison Jones and the various Oozes? Donais: I wouldn't especially look out. There's plenty of weapon-destruction already available to you. I don't think we need to make more. One of the things that we noticed when we were play-testing is weapon-destruction became a really big part of decks if there's a lot of Legendary weapons in addition to the normal weapons. So we designed some of the weapons specifically to have something like Deathrattles, so that destroying them wouldn't leave you with nothing. The Mage weapon, Aluneth, for example, says "At the end of your turn, draw 3 cards." We made it specifically the end of your turn, instead of the beginning of your turn, because we wanted to make it so that if it was destroyed, you've already gained three cards. So 6 mana, three cards, and they have to use the removal on it. You're just doing fine and you've gotten good value out of it already. Shacknews In what ways should players expect to utilize the new Recruit feature? In particular, will recruited minions count towards something like the Un'Goro quests? Shacknews: Rin, the First Disciple players are going to have a long way to go before they can get to Azari, the Devourer. So is there a concern, given the pace of the average game, that Rin will prove too slow for the meta going forward. Donais: Rin is definitely not a card you want to use to stop an aggro deck from killing you, right? If you're playing Rin, it's because you very specifically want a card to win your control matchups. If you're playing against Recruit Warrior or a slow, control N'Zoth deck, then it's a very good win condition to make sure you have something against that. You do go behind on curve by several stat points as you're playing out these creatures, but at least you're playing minions on the board, you can play two disciples per turn if you have 10 mana. But it's definitely not meant to be a tempo card. It's meant to be a late finisher card. Shacknews: It's a little premature to ask this, since new cards aren't being revealed until November 20, but which one particular Hearthstone class should be the most excited about this expansion? Donais: The cool thing is, everybody gets a Legendary weapon, everybody gets a Spell Stone, so I think all the classes have something to look forward to. I think we put a lot of work into making sure each of the weapons has something cool about it. Each of the Spell Stones has something cool about it. Everybody can play in the Dungeon. I'm pretty sure they're all covered. Kindred: They are. But I'm selfish, so Warlock... I want to destroy a deck. Sorry. I'll say Warlock. Donais: You just want to blow up someone's deck? Kindred: Yes! That's my motivation. 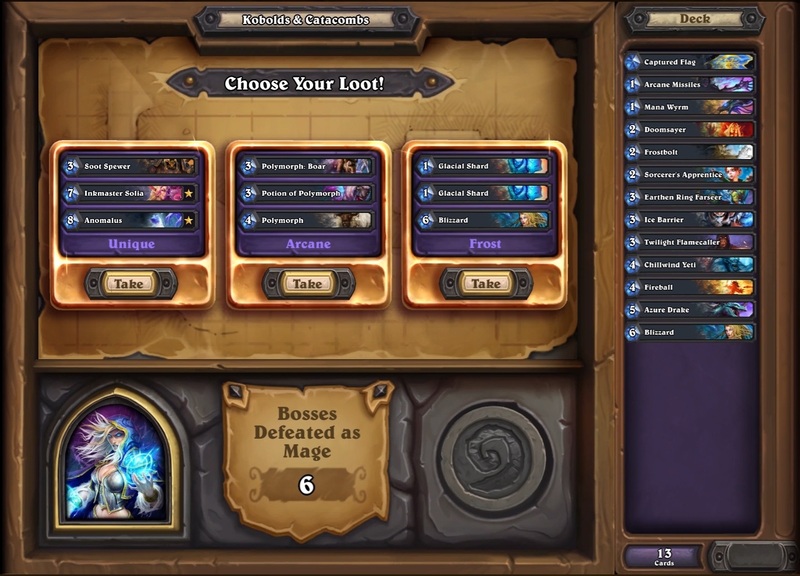 Shacknews: And lastly, going back to Dungeon Run, given the mode's escalating difficulty and "kobillion" possibilities, has any thought been given to creating a blend between Dungeon Run and Arena as a potential new avenue for players to earn rewards? Donais: That sounds really cool! One of the things we do is that we learn stuff every time we make a new thing. So if a year from now, Arena looks like a Dungeon Run, where you play against other players that have done Dungeon Runs, that would be really cool. 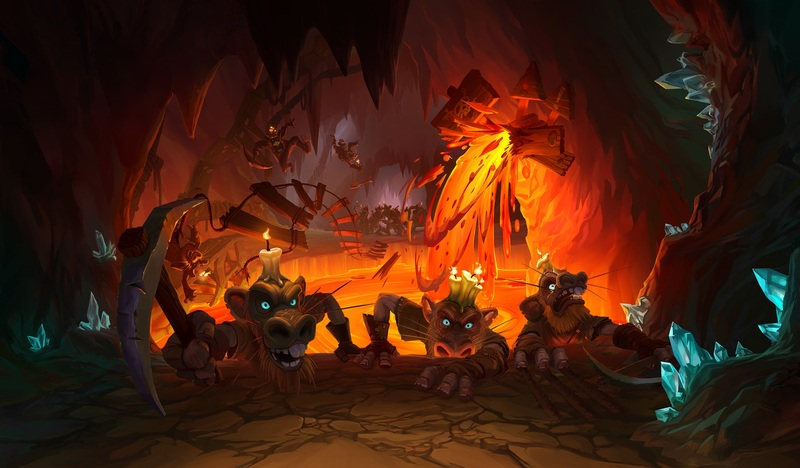 Hearthstone's Kobolds & Catacombs expansion is set to release sometime in December. Look for new card reveals to start seeing the light of day starting on November 20.